Joy is an almost 2-year-old black female, born April 7, 2008. Her sire is Inspecda Deck, and her dam is Hush Hush. 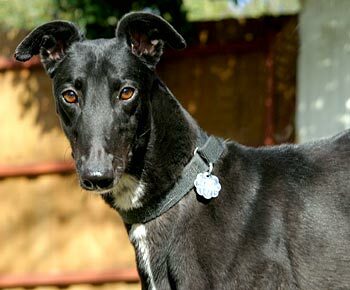 Joy is the “G” pup and was not an individually registered pup in her litter with the National Greyhound Association. 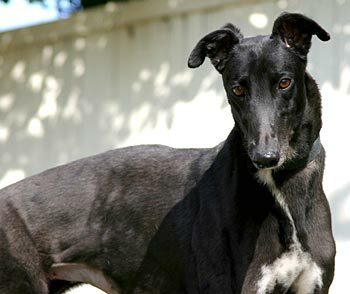 Joy arrived with 4 other greyhounds - Davis, Nick, Kelly and Noel - on December 16, 2009, from a coyote hunter in Amarillo. She has completed all her medical procedures and is ready to find her forever home! Joy is not cat tolerant. We will test her with small dogs at a later date. 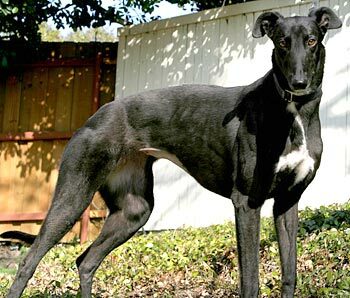 The name Joy accurately describes this small bundle of happy greyhound! Her tail almost never stops wagging. She is energetic, inquisitive, and affectionate. She follows me all over the house. She adores squeaky toys, and will thoroughly test out the squeakers. She plays with the other dogs very well. She loves mealtimes, and is very food-motivated. Joy is very young and still has a lot of puppy in her. This means occasional mischief like taking toys or food from others and some 'creative' chewing. However, she responds well to correction and is learning manners as all young creatures must. Joy is a proficient user of the dog door, and this silly girl actually loves to stand out in the rain. She will make someone a wonderful, loving companion, but no cats please!